This is a map of the universe within 500 million light years. It shows most of the major galaxy superclusters that surround the Virgo supercluster. These superclusters are not isolated in space but together with many other smaller concentrations of galaxies they form parts of extensive walls of galaxies surrounding large voids. Three of the biggest walls near us are marked on the map as well as several of the largest voids. There are several hundred thousand large galaxies within 500 million light years, so even on this scale our galaxy is a very insignificant object. There is a negative version of this map, which might be easier to print. This is a list of the nearest rich clusters of galaxies listed in the Abell catalogue. These are clusters of galaxies which contain many tens or hundreds of large galaxies. I also added the Virgo cluster to this list - George Abell excluded it from his catalogue because it covered too large an area of the sky to appear on a single photographic plate. Column 1: The Abell catalogue number of the cluster. Column 4: The supergalactic longitude. Column 5: The supergalactic latitude. 0 = 30-49 galaxies, 1 = 50-79 galaxies, 2 = 80-129 galaxies. Column 7: The redshift of the cluster relative to the cosmic microwave background. the Hubble constant is 70 km/s/Mpc. Column 9: The supercluster the cluster belongs to. Galaxies, Astrophys J Supp, 70, 1.
dispersions for ACO clusters, Astrophys J, 125, 35. 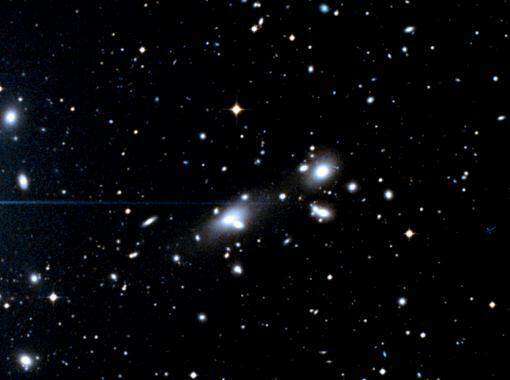 A cluster of galaxies in Sculptor. This is A4038, a rich cluster 400 million light years away. The two brightest galaxies are IC5353 (right) and IC5358 (left). The best introduction to the subject of superclusters is this book 'Large-Scale Structures in the Universe' by Anthony Fairall, (Wiley, 1998). It is an introductory textbook which explains both the history and the future of the entire subject and also contains many accurate (two-dimensional) maps of the distribution of galaxies in the nearby universe. Some examples of his galaxy plots can be seen in this paper written by him and five colleagues in 1990. One useful aspect of Anthony Fairall's book is that he lists many of the major voids in the local universe. This is a list of voids adapted from his list. Some of these voids are labelled on the above map and most of the nearer voids are marked on the 200 million light years map. Void Name       Equatorial   Supergal. Redshift Dist. Diam. Column 1: A name for the void. Column 2: The Right Ascension in hours for epoch 2000. Column 3: The declination in degrees for epoch 2000. Column 6: The approximate redshift of the centre of the void. assuming that the Hubble constant is 70 km/s/Mpc. Column 8: The approximate diameter of the void in millions of light years.